CBI - China: Day 148 of 154 of the Japanese Invasion of Manchuria. CBI - China: Day 16 of 41 of the 1st Battle of Shanghai. CBI - China: Day 43 of 142 of the 1st Battle of Hebei. Germany: Adolf Hitler decides the time is right for Germany to re-occupy the Rhineland. Spain: Day 211 of 985 of the Spanish Civil War. Spain: Day 576 of 985 of the Spanish Civil War. CBI - China: Day 221 of 2,987 of the 2nd Sino-Japanese War. Day 6 of 124 of the Battle of Henan. Spain: Day 941 of 985 of the Spanish Civil War. CBI - China: Day 586 of 2,987 of the 2nd Sino-Japanese War. 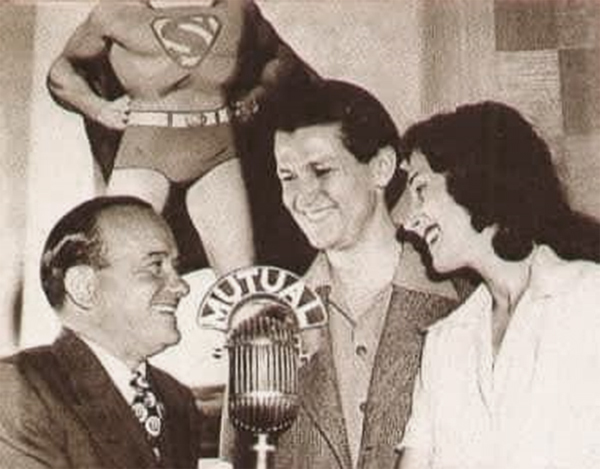 USA: Syndicated radio serial The Adventures of Superman premieres to millions of listeners. DC Comics publisher Harry Donnenfeld (left) with Clayton "Bud" Collyer and Joan Alexander. 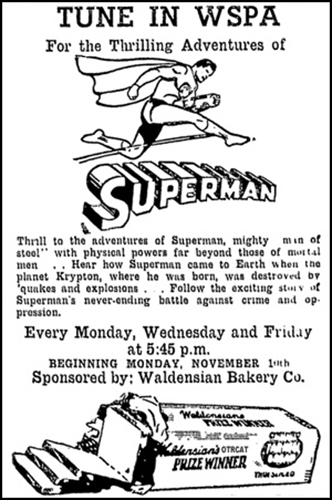 The radio serial was a huge success, with millions tuning in to follow Superman's quest for "truth, justice and the American way." Superman's villains were simple, over-the-top evil-doers. During the war years, the Man of Steel regularly dispensed justice to many a Nazi and Japanese spy and saboteur. 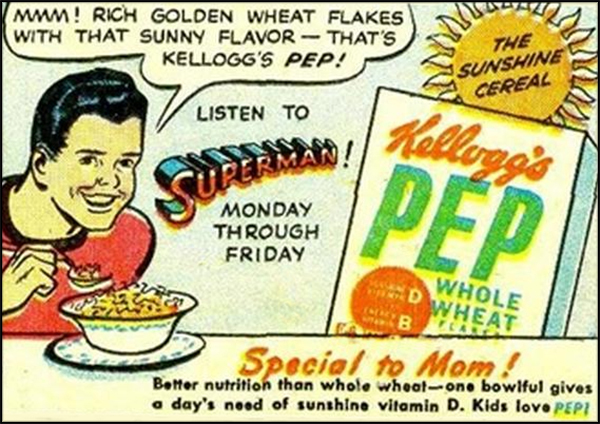 Much of Superman lore originated in the radio show before making its way into the comic book or newspaper strip, such as editor Perry White and young copy boy Jimmy Olsen. Kryptonite was created as a plot device that made Superman incapacitated and incoherently in pain, thus allowing voice actor Collyer to take a vacation. UK: Paper rationing is introduced, with supplies cut by 40 percent. Germany: First deportation of German Jews into occupied Poland. Eastern Front: Germany and Russia agree on a new trade pact that provides for vital war materials by the Russians in return for German manufactured goods. Finland: Day 75 of 105 of the Russo-Finnish War. MTO - Egypt: Anthony Eden greets the first Australian and New Zealand troops arriving to the Suez. CBI - China: Day 951 of 2,987 of the 2nd Sino-Japanese War. Day 90 of 381 of the Battle of South Guangxi. Day 16 of 67 of the Battle of Wuyuan. UK: UK foreign Secretary, Anthony Eden and General Sir John Dill, Chief of the Imperial General Staff leave London for the Balkan capitals in effort to establish anti-axis pacts. ETO - UK: Day 160 of 258 of the Blitz. MTO - Libya: Erwin Rommel arrives in Tripoli with his Afrika Korps. East Africa: Day 248 of 537 of Italy's East African campaign in the lands south of Egypt. East Africa - Eritrea: Day 8 of 56 of the Battle of Keren. CBI - China: Day 1,317 of 2,987 of the 2nd Sino-Japanese War. Day 14 of 31 of the Battle of South Henan. CBI - Thailand: Day 135 of 221 of the Franco-Thai War (Vichy France vs Thailand). Atlantic: Day 30 of 169 of Germany's Second "Happy Time," during which U-boats sink 609 Allied ships with little risk. Day 2 of 3 of the German Channel Dash (Operation CERBERUS). British attacks fail as the German Fleet sails through the Channel. Russian Front - North: Day 158 of 872 of the Siege of Leningrad. Russian Front - North: Day 5 of 102 of the Battle of the Demyansk Pocket, another failed attempt to break the siege at Leningrad. Russian Front - North: Day 21 of 103 of the Battle of the Kholm Pocket. Another attempt to break the siege at Leningrad. Russian Front - Center: Day 36 of 103 of the Battle of Vyazma, Russia. Russian Front - Center: Day 36 of 103 of the Battle of Sychevsk, Russia. Russian Front - South: Day 106 of 248 of the Siege of Sevastopol, Crimean Peninsula. All German attacks against Sevastopol are stopped for the winter. CBI - Burma: Day 61 of 164 of Japan's Invasion of Burma. CBI - China: Day 1,682 of 2,987 of the 2nd Sino-Japanese War. Day 51 of 99 of the 3rd Battle of Changsha. CBI - Java: Day 14 of 17 of the Battle of Singapore. PTO - Borneo: Day 59 of 107 of the Battle of Borneo. PTO - Philippines: Day 67 of 152 of the 1st Battle of the Philippines. 5th Air Force provides air support. ETO - UK: US 8th Air Force: Flying Spitfires, the 4th Fighter Group flies shipping and defensive patrols. Russian Front - North: Day 523 of 872 of the Siege of Leningrad. Russian Front - North: Day 3 of 51 of the USSR's Operation POLAR STAR, a failed offensive north of Leningrad, hoping to take the southern shore of Lake Ladoga, Russia. Russian Front - North: Day 3 of 4 of the Battle of Krasny Bor. Soviets fail to recapture this strategically important town near Leningrad. Russian Front - North: Day 284 of 658 of the Siege of the Kholm Pocket, USSR lays siege to the Kholm Pocket but the Germans hold out for a about a year and a half. Russian Front - South: Day 63 of 69 of the USSR's Operation LITTLE SATURN. A successful drive into the Northern Caucasus and the Donets Basin pushing the Axis troops out. Soviets capture Rostov. Germans evacuate Krasnodar and take defensive positions at the Kuban bridgehead. MTO - Tunisia: Day 88 of 178 of the Battle of Tunisia. RAF and US Air Forces provide Allied air support. Rommel launches a counter-attack against US 2nd Corps forcing them back in some disarray. CBI - Burma: Day 54 of 104 of the 1st Battle of Arakan. Wingate's first Chindit guerrilla campaign hits behind the Japanese lines. US 10th Air Force provides air support. Today is the first use of 2,000 pound blockbusters bombs in the CBI Theater. CBI - Burma: Day 5 of 79 of the Allied Operation LONGCLOTH. CBI - China: Day 2,047 of 2,987 of the 2nd Sino-Japanese War. PTO - Alaska: Day 251 of 435 of the Battle of Kiska, Aleutian Islands. PTO - Solomon Islands: US 13th Air Force attacks the Munda area on New Georgia Island. ETO - France: US 8th Air Force B-24s hit the V-weapon site at St Pol/Siracourt. Russian Front - North: Day 649 of 658 of the Siege of the Kholm Pocket. USSR lays siege to the Kholm Pocket but the Germans hold out for a about a year and a half. Russian Front - North: Day 30 of 48 of the Battle toward the Narva River, Estonia. This drive helped lift the Leningrad siege and goes on to liberate Narva. Russian Front - North: Day 11 of 191 of the Battle of the Narva Isthmus, Estonia. Russian Front - North: Day 30 of 33 of the Battle of Luga, Russia. The Soviets recapture Luga. Taking this town west of Leningrad will open the door toward Estonia. Russian Front - South: Day 51 of 113 of the USSR's Dnieper-Carpathian Offensive in southwestern Ukraine. Russian Front - South: Day 14 of 31 of the Battle of Nikopol, Ukraine. Russian Front - South: Day 20 of 25 of the Battle of the Korsun Bulge in Ukraine. MTO - Italy: Day 27 of 123 of the Battle of Monte Cassino. RAF and US Air Forces provides air support for the Allied ground troops. MTO - Italy: Day 22 of 136 of the Battle of Anzio. The Allies are pushed back to a final defense line at Anzio. RAF and US Air Forces provides air support for the Allied ground troops. CBI: US 14th Air Force attack targets in Burma, French Indochina, and sink ships in the Gulf of Tonkin. CBI - Burma: Day 45 of 99 of the 2nd Battle of Arakan. CBI - Burma: Day 8 of 19 of the Battle of the Admin Box. US 10th Air Force provides air support. CBI - China: Day 2,412 of 2,987 of the 2nd Sino-Japanese War. PTO - New Guinea: Day 147 of 219 of the Battle of Shaggy Ridge. 5th Air Force provides air support. PTO - New Guinea: Day 144 of 162 of the Battle of the Huon Peninsula. 5th Air Force provides air support. PTO - New Guinea: Day 60 of 597 of the Battle of New Britain. US 13th Air Force provides air support. PTO - Solomon Islands: Day 104 of 295 of the Battle of the Bougainville Islands. US 13th Air Force provides air support. South America: Peru declares war on Germany and Japan. ETO - France: Day 196 of 284 of the Battle of Brittany. ETO - France: Day 151 of 236 of the Siege of Dunkirk. ETO - Germany: Day 5 of 16 of Operation GRENADE, the US drive into Germany. US 9th Air Force provides air support. ETO - Germany: Day 5 of 17 of Operation VERITABLE, the British and Canadian drive into Germany. British and Canadian troops advancing from Holland take Cleve. ETO: Day 24 of 66 of the Battle to the Rhine. US 9th Air Force provides air support. Russian Front - Finland: Day 151 of 223 of the Lapland War. Finland and Russia have joined forces to kick the Germans out of Finland's most northern province. Russian Front - Center: Day 121 of 206 of the Battle of the Courland Pocket in Latvia. Russian Front - Center: Day 19 of 75 of the Battle of Königsberg, East Prussia (now Kaliningrad, Russia). Russian Front - Center: Day 17 of 17 of the Battle of Rastenburg, East Prussia. Thus far, the Kriegsmarine has evacuated 374,000 German refugees by sea from East and West Prussia. Russian Front - Center: Day 18 of 63 of the Battle of the Heiligenbeil Pocket in East Prussia. Russian Front - Center: Day 3 of 54 of the Battle of East Pomerania, Germany. Russian Front - Center: Day 5 of 17 of the USSR's Lower Silesian Offensive (Poland). Russian Front - Center: Day 12 of 31 of the Battle of Schwedt, Germany. Russian Front - South: Day 107 of 108 of the Battle of Budapest, Hungary. The Soviet siege continues. Yalta: The Yalta Conference ends and the agreements made are announced regarding post-war governing of Europe. The USSR also agrees to enter the war against Japan. CBI - Burma: Day 25 of 61 of the Battles of Meiktila and Mandalay. The US 10th Air Force provides air support. CBI - Burma: Day 23 of 39 of the Battle of Ramree Island. The US 10th Air Force provides air support. CBI - Burma: Day 9 of 99 of the Battle of Pakokku and Irrawaddy River operations in central Burma. The US 10th Air Force provides air support. The British 20th Indian Division crosses the river Irrawaddy southwest of Mandalay. CBI - China: Day 2,778 of 2,987 of the 2nd Sino-Japanese War. US 14th Air Force attacks and destroys sixteen locomotives. PTO - Japan: US 7th and 20th Air Forces bombs targets on Iwo Jima in preparation for the upcoming amphibious invasion. PTO - New Guinea: Day 413 of 597 of the Battle of New Britain. PTO - New Guinea: Day 297 of 481 of the Battle of Western New Guinea. PTO - Philippines: Day 116 of 299 of the 2nd Battle of the Philippines, aka the Liberation of the Philippines or the Philippines Campaign. PTO - Philippines: Day 60 of 244 of the Battle of Luzon. 5th Air Force provides air support. PTO - Philippines: Day 13 of 22 of the Battle of the Bataan Peninsula. 5th Air Force provides air support. PTO - Philippines: Day 10 of 29 of the Battle of Manila.